Filed to: Otto porter jr.Filed to: Otto porter jr.
Take a look at the star players on each of the college basketball teams ranked in the top five this week, and you'll notice a common pairing: Gonzaga's Kelly Olynyk has Elias Harris. Indiana's Victor Oladipo has Cody Zeller. Kansas's Ben McLemore has Jeff Withey. Duke's Seth Curry has Mason Plumlee (and now Ryan Kelly, who's back from a foot injury). But in D.C., there's Georgetown's Otto Porter Jr., a 6-foot-8 sophomore who's basically a one-man show. Have You Had Your Victor Oladipo Moment Yet? Over that stretch he has shot nearly identical percentages on both his 2s (52 percent) and 3s (51). Porter has been on the floor for 596 offensive possessions in those 11 games, and he has committed only 16 turnovers. In his past six games he has averaged better than eight free throws per contest, and he has connected on 86 percent of those attempts from the charity stripe. Porter's solo high-wire act became obvious a couple of weeks back, when he scored 33 of the Hoyas' 57 points in their win at Syracuse. But he didn't do it with reckless gunning; he did it because he had to: He was 12 of 19 from the field that day, while the rest of the Hoyas were 7 of 35. Georgetown won its next game in double overtime at UConn. Porter played 49 minutes and scored 22 points—with all but one coming after halftime—and his hard-charging layup in the closing seconds of the second OT ultimately won it. Then there's what Porter did Sunday, when Rutgers tried to neutralize him by putting him on the line: He made 15 of his 18 foul shots and finished with 28 points. Wednesday night, the Hoyas were a hot mess offensively. They turned it over 23 times, nearly twice their season average. At one point, during a stretch of more than three minutes in the first half when they were held scoreless, they turned it over five times. Some of this can be credited to Villanova's excellent changing defenses, which worked to keep the ball out of Porter's hands, limiting him to just one shot in that span. But some of it was just the sloppy, plodding ineptitude of Porter's supporting cast in Georgetown's halfcourt offense. When he did get the ball, Porter avoided forcing shots, smartly deferring to his teammates when the situation called for it. He only made six of his 16 field goals, but he finished with a team-high 17 points in addition to five assists. And he was responsible for only two of those 23 turnovers. 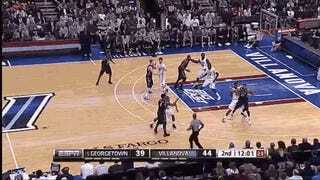 In the first play, the Hoyas were set to inbound from under the Villanova basket. Just before it began, ESPN2's LaPhonso Ellis can be heard saying, "I think Georgetown has to find a way to get Otto Porter a look on the move." As if on cue, Porter lost James Bell under the basket with a simple, perfect fake and cut. Nate Lubick immediately got him the ball for an easy layup. In the second play, Porter created his own space to connect on a jumpshot. He caught the ball on the wing, where he was isolated with Bell matched up to stick him. Porter thought about finding a way to go around Bell, who actually played solid defense most of the night but was victimized by Porter's ability to use his size in different ways. Bell took away Porter's dribble, even as Porter attempted a spin move. So Porter did the only thing left for him to do in that spot: He stepped back, faded away, and knocked down the shot with Bell's hand in his face. It was impossible to stop, and it was exactly the sort of play Porter has used to carry Georgetown this season.